East Cafe is close to route 1. Every summer Ginny Cheung makes the decision to close her East Lansing Chinese restaurant for a few weeks to travel. With her largely Asian college student customer base on summer break, it didn’t make financial sense to keep the doors open. 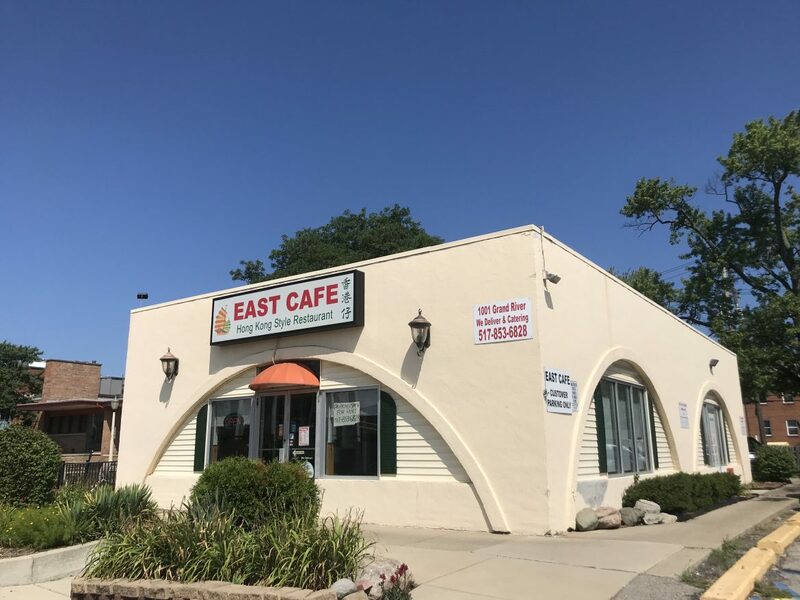 But this summer, East Café located at 1001 E. Grand River Ave. didn’t close its doors. According to a report from Michigan State University Office for international students and scholars (OISS), from 2012 to 2016, the amount of undergraduate international students from Asia was the highest for the past five years. As summer vacation comes, those large group of students will mostly choose to go home. With their absence, Asian restaurants in East Lansing area can lose profits during the summer. East Café’s location is in the college town, and the majority of its customers are students. “I think because of the nature of East Lansing being proximate to the university, the main trust of our economy in downtown is really driven by the student population,” said Thomas Fehrenbach, East Lansing community and economic development administrator. Cheung said this summer is actually not that bad. Another challenge for East Café is, because the customer base is limited, the preservation of food becomes difficult. Among Asian international students, another report shows that Chinese students comprise the largest population from 2012 to 2016. To reach those Chinese students, East Café established a chatting group on WeChat, a Chinese social media platform that enables messaging, paying and sharing photos and stories, and shares their special menu every day in it. When there aren’t many people eating at the store, Cheung uses the time to train her staff to better serve her guests. Mi Sushi & Noodles (Mi), a Japanese-style restaurant located at 3340 E. Lake Lansing Road, had its grand opening Nov. 17. Unlike East Café, which had been experienced the summer season for nine years, this is Mi’s first summer. 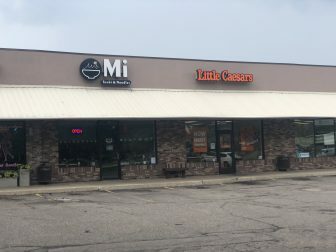 “We were a new store with very little knowledge about summer business,” said Shanshan Xu, manager of Mi, who has been lived in East Lansing for more than 10 years. The big “Mi” sign is hard to miss on the street. The store is close to route 24. Mi is about a 12-minute drive from campus. Xu said their target customers are all MSU students and local residents. Xu decided to decrease workers’ hours to better sustain the business in the summer. 517.Today is a delivery app that serves locally that primarily covers the Midwest, including Lansing. Mi plans to enroll in 517.Today to start its delivery service beginning in the fall semester. “We are updating our new menus and studying new meals to better prepare for this,” Xu said. Joy Shantz, international student adviser and programming coordinator from OISS said the Asian students who attended MSU in 2017 was 7,004, which is 14% of all MSU students. Shantz said OISS doesn’t specifically send Asian students to restaurants or doctors but does tries to connect students with community. Xiaoyun Chen is an economic major Chinese international student at MSU who just graduated in May, said it’s more convenient to eat outside because it takes long time to cook at home. Not all international students prefer going out to eat, however. Ruiming Zhao, a Chinese international student majoring in computer science engineering at MSU, said he stays in East Lansing for the whole summer because going home requires additional work. “You have to book tickets and update the visa,” he said. Zhao said he would prefer cooking at home to going out to eat. Fehrenbach said the East Lansing City Council tries to help with summer losses by creating policies that plan for housing types that aren’t just students. “They have a 25% requirement for any new housing that develop either 55-and-over housing, housing for owner-occupied like condos or houses or for low-to-moderate income,” he said. Maggie Huang, who is in charge of a Chinese restaurant named Hong Kong, said she saw couple of apartments were built up in two years. Fehrenbach gave an example of Center City project to explain the policy. Another way to help from a marketing perspective is that the city council creates many events during the off-season to raise visibility for the restaurants. Fehrenbach said the city council does a lot of marketing locally through residents and neighborhood associations. “Especially during those off-season times to come and visit is a great time to get service in a restaurant when it’s not as crowded,” he said. Renewed wall of Mi. The store is waiting for students to come back and visit. With only a few weeks away from school starting, these restaurants are looking forward to students returning. 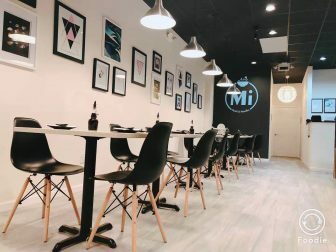 The abbreviation MI commonly represents Michigan, but a family in East Lansing gave the symbol another meaning as Mi Sushi & Noodles restaurant was born. Mi Sushi & Noodles (Mi) is a family-owned, Japanese-style restaurant located at 3340 E. Lake Lansing Road.